As a teacher, it’s essential to know what to do when kids misbehave. Most schools advocate a time-tested approach: The punishment should fit the crime. But sometimes, there’s no clear disciplinary action. Especially when it’s a really great kid and a momentary error in judgment. And so it was that Tamara, age 7, stared into a big pot of tempera paint. The paint was opaque and viscous, a swirl of blue and white. Its glossy surface mirrored her big, brown eyes. And then, the paint rippled — her fingertips had broken the surface. It felt cool. She continued. The paint swallowed up her joints, her knuckles, and then — the art teacher saw her. Elbow-deep in blue paint, Tamara suddenly felt 30 pairs of eyes boring into her. The eyes widened and watched, darting between the teacher and Tamara. Nobody knew what would happen next. Write what you should have done: Mix the color the right way and with respect. Then, she turned it over. 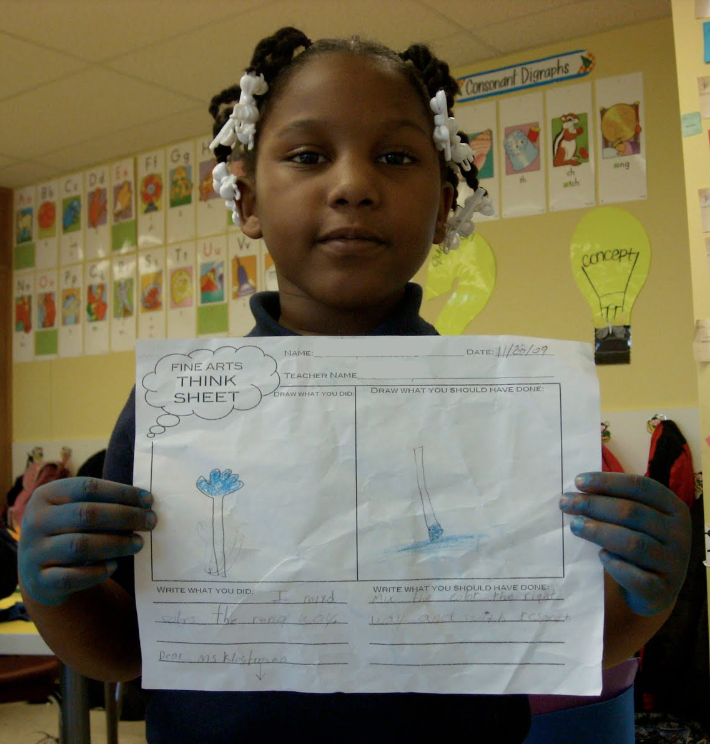 In the blank space, she added: I think I should have blue hands all day to remember what I did. And so she did — and never felt, or looked, blue again. I love this story. Tamara sounds like such a cutie and I really like how she drummed up her own punishment. This is hysterical!!! I have a 2nd grader and a Kindergartner….this could more than possibly be about my Kindergartner!! !